Flip-up loupes and through the lens loupes have a few similarities most especially in terms of functionality. However, these two types of surgical loupes also have a couple of differences. On the first part of this blog series, we have discussed what flip up loupes and TTL loupes are. We also give the differences between these two types of loupes in terms of convenience, price, customization, and optical barrels positioning. Today we are going to continue to talk about the other differences between TTL loupes and flip-up loupes. The absence of the added weight of the hinge mechanism in TTL loupe makes it lighter than the flip up loupe. Moreover, the optical barrels of the TTL loupe for surgeons does not protrude out further unlike those of the flip up loupe which eliminates the need to rebalance the weight with the use of the shoulder or neck muscles. This is one of the primary reasons why TTL loupes are considered more comfortable to use than the flip up loupes. The optical barrels of the flip up surgical magnification loupes are not drilled into the carrier lens. They are instead attached to a hinge mechanism which is obviously positioned a bit distant from the user's eyes. As a result, the magnification lens only offers a narrower field of view. The optical magnification barrels of the TTL loupes, on the other hand, are drilled and attached directly to the carrier lens. And since they are positioned closer to the eyes of the user, they provide a wider field of view. 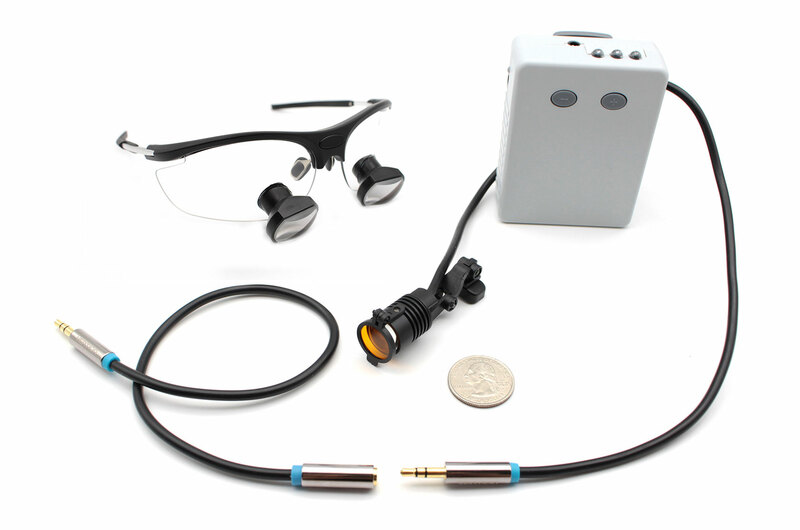 This means that TTL loupes allow the user to clearly see a larger focused area when working as compared to that of the flip up loupe of the same magnification power. Again, TTL loupes are basically custom-made to fit the user's personal specifications and optical needs including a prescription lens to ensure utmost comfort, perfect vision, and high-level focus. The user can add his current prescription lens during the customization process. One of the downsides of TTL loupes is that you can not easily have your prescription lens changed anytime. For TTL loupes, changing a prescription lens is almost the same as doing the customization process again which can be quite expensive. Flip up loupes are more convenient and more practical for users who are wearing prescription lens. The good thing about flip up loupes is that since the optical barrels are not drilled onto the carrier lens, it is easier and quicker to change the prescription lens. Prescription lens normally changes over time. Unless otherwise, the user is using a contact lens instead of the traditional prescription lens, the TTL loupes can be a bad choice. The optical barrels of the TTL loupes are positioned at the steepest possible angle of declination to make sure that the user can achieve the best ergonomic posture. And since they are fixed in place, their angle of declination cannot be manually adjusted. The flip up loupes offer adjustable optical barrels making it possible for the user to easily and manually adjust the angle of declination at different positions. This concludes this two-part blog post about the differences between flip up loupes and TTL loupes. We hope that you are able to come up with the best decision about which of the two types of surgical loupes you will purchase based on the information provided here. This entry was posted in Surgical loupes product comparison | Schultz Dental surgical blogBy Roger Jing On Aug 26, 2017 .